#91 Re: ACH transfers from USA to Bangkok Bank -Alert! Up2u wrote: I am not happy. Stay tuned. For reference, in the UK, I think Transferwise can only debit about £2000 (?) from my bank at present. As my transfers have been larger than that, I set up Transferwise, then log on to my bank account and send the money to Tansferwise, which is almost instantaneous. Then for the second step, the money usually ends up in the ASEAN account within about 15 minutes, so the whole job is done in 30 minutes. I am very happy with this & have used the system 7 times so far. You might want to query the best way of moving money to Transferwise in the US. Obviously the UK banking system is different from the US. No idea which is better, but you certainly have an advantage in some areas. e.g. Banks that refund those nasty Thai ATM fees. Is anyone considering proceeding with their other service of a "borderless account" ? #92 Re: ACH transfers from USA to Bangkok Bank -Alert! Up2u wrote: After successfully setting up my TW account, I initiated a send money transaction ($2000) on Wednesday the 31st. Their system did a handshake with my Schwab Bank account and everything went smoothly with a scheduled delivery date of Nov 2. I checked the TW system regularly and noticed the money was still sitting in my Schwab account so I fired off an email inquiry. Everything was OK was the reply. This morning (Friday), TW finally pulled the money and updated their tracking system with a message showing the delivery date of Nov 5, Monday. I am not happy. Stay tuned. As I previously mentioned, when I sent a transfer on Friday, it arrived on Monday. The next one I did, I sent on a week day and it arrived the next day. I sent a 3rd transfer on 1 Nov (Thu) and it arrived on 2 Nov (Fri). Similarly with Bangkok Bank NY, it usually took about 3 days unless there was an intervening weekend, then it took 5 days. So it appears TW will have it to you the next day, but if on Friday, it will the following Monday because of the intervening weekend. In this latest transfer, it took about 2 or 3 hours from the time I initiated the transfer with TW before it was drawn from my bank account (email from TW stating they rec'd the funds) and in the next 30 minutes or so, another email saying funds had been transmitted to my bank). On Thursday, before the TW transfer, I also sent a transfer from my bank through ACH to Bangkok Bank NY - so I expect it will arrive on Monday or Tuesday - I will post when it arrives to show the comparison between the two. #93 Re: ACH transfers from USA to Bangkok Bank -Alert! I just sent 5 USD to myself(Bangkok Bank) using TW. Took about 30 seconds to send .... arrival date Tuesday, Nov 6, we'll see. #94 Re: ACH transfers from USA to Bangkok Bank -Alert! Just one question which I hope has not been answered before. I note the rate for these transfers are very favorable, but is there a fee levied by Transferwise for each transfer - as happens with virtually all high street banks in the UK? #95 Re: ACH transfers from USA to Bangkok Bank -Alert! #96 Re: ACH transfers from USA to Bangkok Bank -Alert! Yes, TW charges a fee and it varies depending on funding source and amount being sent. An ACH pull from your bank account or debit card appears to be minimal then the transfer fee is added - I noted for smaller amounts $100 - $300, it is around 3%, but for larger amounts, it is about .8% - if you google TW and go to their site, you can see fees and exchange rate without having to register -- put sending currency in top box (e.g., USD), amount to be sent, select funding source and receiving currency in lower box (e.g., THB). The page should show you the fees for the funding source and transfer, which are deducted from the amount sent and the remainder converted to baht showing in the lower box - the exchange rate, if I recall correctly is shown below the THB to be sent. The fee for using a credit card is much higher than the other sources. You can play around with this page by changing amounts and funding sources to see what costs will be involved. #97 Re: ACH transfers from USA to Bangkok Bank -Alert! 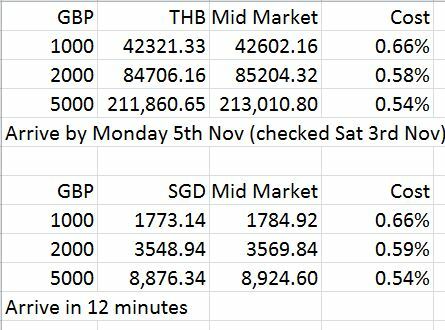 Having read the previous posts, I just made some checks for transfers from the UK via Transferwise & compared with mid-market. Will be interesting to see how US rates compare. 2 Transferring to Thailand is slower than to Singapore. For Singapore, it's 12 minutes on a Saturday evening, when the banks are closed. Which is good going in my view. The money would not get to Thailand until Monday, which is of course, the next working day. Also, my transfers have all cost around 0.48~0.5%. Either the price has gone up by 0.05% or it costs more at a weekend (my guess is the latter). #98 Re: ACH transfers from USA to Bangkok Bank -Alert! After spending a week or so tearing my hair out trying to figure out a way to open an American bank account from Thailand, it turns out that you can indeed have direct deposits go into Transferwise, with standard ACH rather than IAT format. I did not understand that until Transferwise sent me an Email telling me how to do it with use of a "borderless account" right on their own web site. TransferWise wrote: First after you log in to your TransferWise profile go to the Balances section on the left hand side of your profile – You will see a button that says Get Started – You can then activate the USD currency to open the borderless account. You will then get your USD bank details when looking at the Balances area of your profile. Of course many more currencies other than USD are available. There will be a currency logo at the top of the page. You click on that logo and a page pops up showing your name, a Transferwise account number, routing numbers for both wire transfer and ACH, and their New York address. Again, they'll have an address for your home country if you are not using Transferwise from the USA. That's the information needed for direct deposits. Once it is getting close to April 1, I will cancel out the direct deposit that goes to Bangkok Bank's New York branch and instead have my direct deposit go to the Transferwise account. That will eliminate the need for the IAT format. Transferwise's fees to then transfer the money into my Bangkok Bank account are more expensive than direct deposits to Bangkok Bank's New York branch, but for me it will be well worth it to eliminate the need for paper checks being sent to me and then having to wait 45 days for them to clear after depositing them into my Bangkok Bank account. Definitely a big relief to discover the entire process was available via Transferwise all along and I simply did not understand that. Well, I sure understand it now . . . I thank 2lz2p for telling us about the existence of Transferwise. #99 Re: ACH transfers from USA to Bangkok Bank -Alert! You can activate your TW account now and have a friend or family member send you a test amount. Changing a direct deposit can be more cumbersome than setting one up so allow enough time. As of early Monday morning I still have not received my money via TW which was initiated on October 31. #100 Re: ACH transfers from USA to Bangkok Bank -Alert!